Thames Marine Services is run by 3 directors; Robert Dwan, Nicholas Dwan & Joseph Ellis. 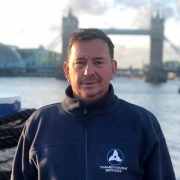 Separate to Thames Marine Services, Joseph is a keen property developer and has set up his own successful construction company, which he has been running for almost 20 years. He provides TMSL with his valuable business experience input and brings a strong skill in his leadership qualities to the team. He has been a lifelong friend of the Dwan family and went to school with Robert & Nicholas. Robert & Nicholas are brothers. The Dwan family name is steeped in Thames history and traditions that are carried on by the brothers to this day, with both brothers winning the prestigious Doggetts Coat & Badge Race in their year of competition. Their father, uncle and cousin have also previously won their year, meaning the Dwan family currently has the most living winners. 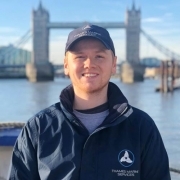 As well as growing up working and gaining experience with their father on the Thames, Robert & Nicholas have worked in a variety of other companies, gaining as much experience in various fields in the industry as possible. Both are qualified Captains with full BML with LPV & Oil Cargo endorsements. Together, the three directors recognised the valuable opportunity of providing a great fuel delivery service on the river Thames and set up Thames Marine Services in mid-2015. Since going live in October 2015 as a Fuel delivery service, other services have been added along the way and relevant registrations and certificates gained to support the additional service provisions, including selling lubricants, providing crewing services, mooring services, engineering services and Waste Oil Removal service. All the while, making sure a high quality of customer service comes first and always looking to go the extra mile for our customers. Harry comes from a family of Watermen. He joins his Father and Uncle as Doggetts Coat & Badge Race winners. Harry won his race in 2014. Harry qualified as a captain in 2013 (full BML with LPV & Oil Cargo) and gained experience as a captain with various companies. He joined Thames Marine Services in April 2016 in the Captain role. He is experienced in captaining the Armador II, the Conquestor and the Heiko. Paul came from a construction background of more than 12 years’ experience, but had an interest in working on boats which started with powerboat racing with his Dad. 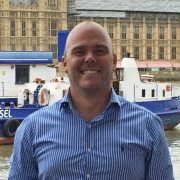 In 2010 Paul went afloat on the Thames and gained his BML in 2016. His river experience included working in many areas from mechanical repairs to captain of smaller vessels. 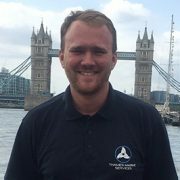 This experience led to Paul to being the safety boat fleet engineer for the European games in 2015 in Baku. He joined the team at Thames Marine Services in January 2017 as a crew member and was promoted in May 2018 to the role of Captain. He has experience Captaining the Conquestor and Heiko. Paul’s proudest moment was being part of the jubilee pageant. 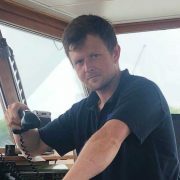 Jamie’s background consists of time spent on Inland Waterways as a Thames Waterman and deep sea as an Officer in the Merchant Navy. 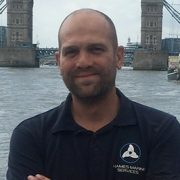 Jamie came to Thames Marine Services in August 2017 in the role of Captain, with a variety of experience gained in the marine oil and gas industry having served on vessels including Very Large Crude Carriers (VLCCs), Liquified Natural Gas (LNG), oil exploration, Offshore Oil & Gas Support Vessels (OSVs) and Floating Storage Units (FSUs). Jerry comes from long line of traditional waterman and started his career on the river in 1985. Over the past 33 years Jerry has worked in all aspects of the marine industry on the Thames including passengers, rough goods and watering. Jerry along with his nephew and brother is a winner of Doggett’s coat and badge (1992) and in 2007 was made a Waterman to Her Majesty the Queen. 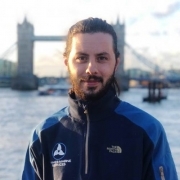 Max is from a large family of Thames Waterman and has spent most of his adult life working on the river. He enjoyed a few years living overseas where he took break from his apprenticeship. Upon his return in 2016 Max gained his BML and Oil Cargo endorsement with Thames Marine Services. He has worked on many different vessels on the Thames from small work boats up to some of the largest passenger boats. Joe comes from a family of Watermen. He joined the river when he was 16 and has done a variety of work on the river since then. 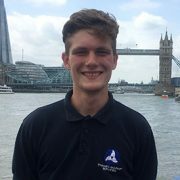 He joined Thames Marine Services in September 2017 as a crew member and he is working towards his BML and freedom of the City of London. Jonathan has worked in the marine industry for the past 18 years. 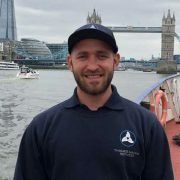 He joined the Thames Marine Services team in January 2018 as our Fleet Engineer. His experience includes managing a Chandlery, Test pilot XSMG world, from man-in-a-van engineer to Build Engineer for the latest J-Class SVEA. Including project managing 3 refits on Yachts 40m+. 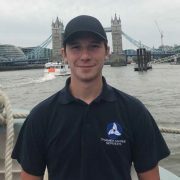 Alex is an Officer of the Watch Unlimited qualified Engineer with experience in the offshore and yachting industries. He has worked on a range of vessels all over the world as well as being involved in large dry dock projects in Gibraltar and La Ciota. 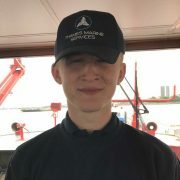 Max was originally apprenticed by his grandfather and gained work experience through Woods Silver Fleet before joining Thames Marine Services in January 2017. Since then, he has gone on to compete in the annual Barge Race and Sculling weekends with Waterman’s Hall, winning most improved sculler at Henley 2017. He is due to complete his apprenticeship with Thames Marine Services in 2020. Apprentice Engineer since April 2018. Trina has an NVQ Level 2 in Business and Administration and manages the Thames Marine Services office and all its administration and organisation. She has been with the company since its conception. Her first duty was to set up the office and running of the business in September 2015. She has also studied Event Planning in her spare time, gaining a Diploma with the Institute of Event Planning. 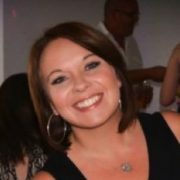 Trina is a highly valued member of the team and lends her warm, friendly personality to the voice of the company and her professional, organised and efficient skills to the management side of the business. Her previous roles have included Sales & Business Development Manager, Recruitment Manager and Void Security Team Leader. 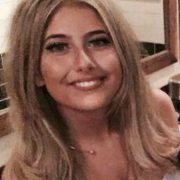 Elle joined the office team in April 2018 as a Trainee Office Administrator. Joining Thames Marine Services is a new career path for Elle and she is enjoying learning about the industry and building a rapport with the clients.